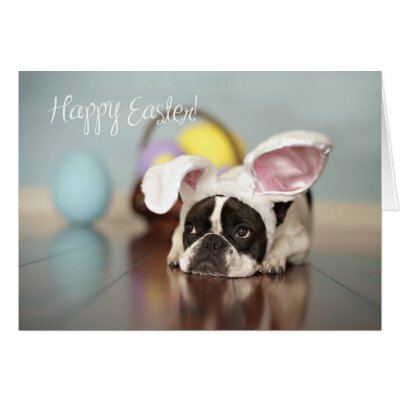 A handpicked collection of Easter cards starring cute Easter bunnies, dogs, cats, chicks, and chocolate eggs! Bunnies, chickens, and decorated eggs, are well known Easter symbols. 8 fun, humorous Easter cards for kids, grandkids, nieces, and nephews. Joyeuses Pâques! Frohe Ostern! Felices Pascuas! Buona Pasqua! Happy Easter, Kids!! 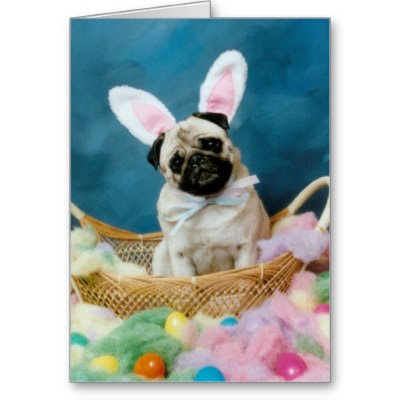 The cutest pug looking adoringly at you from an Easter basket, dressed as an easter bunny with bunny ears and a bow made of ribbons! 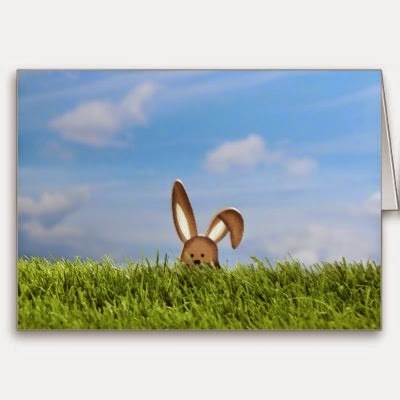 A cute Easter bunny, from Germany, peeking at you from a green meadow, with one ear flopped down and the other straight. 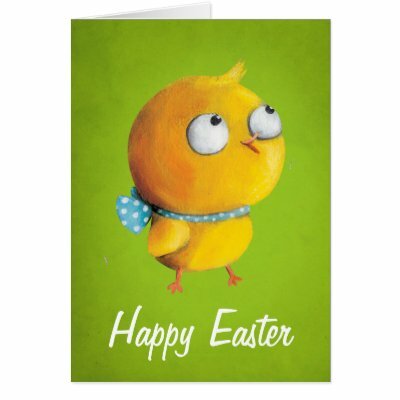 Happy Easter time wishes from a cute, adorable, yellow, chicken wearing stylish blue polkadot ribbon! Two cute, decorated, chocolate Easter eggs, looking like the couple Mr. and Mrs. Potato Head, wishing you Happy Easter! 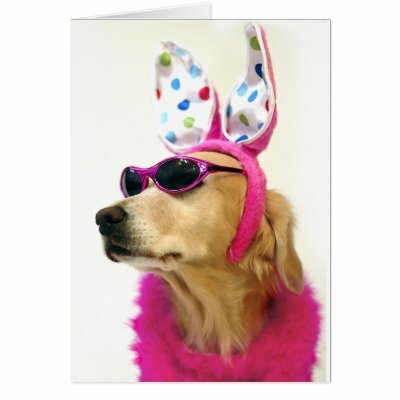 Funny, cute Easter card featuring a stylish Golden Retriever wearing polka dot bunny ears, pink boa, and sun glasses! 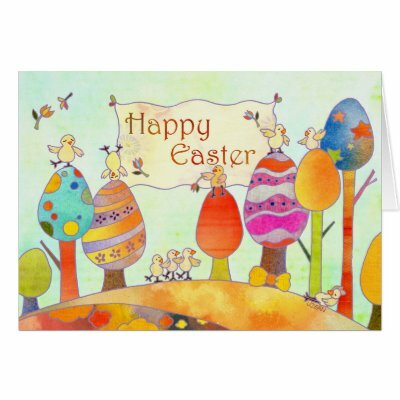 Colorful card, featuring playful little chicks, joyfully celebrating Easter in Easter Land! 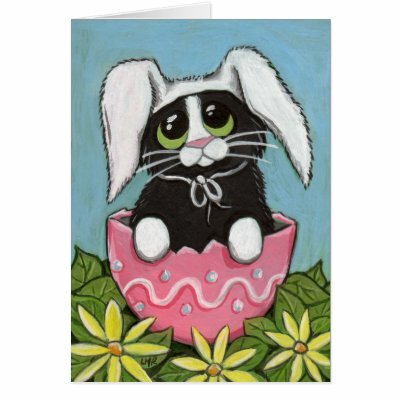 A cute, probably the cutest, Easter kitty, looking up at you from an Easter egg, with an adorable, soulful gaze. A cute French Bulldog in Easter bunny ears, with Easter basket and Easter eggs in the background, wishing you a Happy Easter! Easter Sunday is all about family fun and smiles! Egg hunts, chocolate Easter eggs, marshmallow bunnies, egg decorations, Easter brunch, parades - enjoy it all! Have a great time with friends and family, celebrating Easter! P.S. All of the above greeting are customizable. 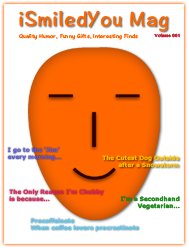 You may add your own text and images to the inside, or anywhere on the cards, at no charge.